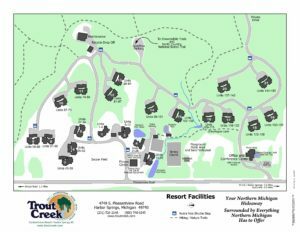 For your convenience, double click on the link below, Trout Creek Resort Map, for a larger printable image. Please note that the green areas are woodsy and the white represents a grassy area. Dotted lines are hiking trails. Have you ever been on a Scavenger Hunt? When you visit us next time be sure to stop at our Front Desk to pick up your packet with a map, pen and directions for the scavenger hunt. Our trails are filled with all sorts of paw prints, cool trees and small waterfalls. 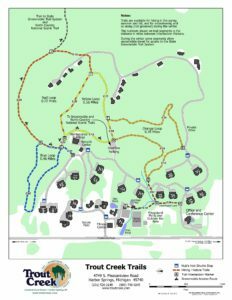 Have fun hiking while exploring the nature that surrounds Trout Creek.